John is the son of legendary Johnny and June Carter Cash. Despite growing up in hard times, John says his dad’s family made suppertime an important daily gathering. Carrie, John’s grandmother, made all her meals on a wood-burning stove. It was at his dining room table that Johnny Cash learned the value of family. When Johnny was 12, the family faced a terrible tragedy. Johnny’s brother, Jack, was killed in an accident. Jack was aspiring to be a pastor; his personal Bible annotated in lead pencil marks. “Dad never really got over Jack’s death and was deeply inspired by his brother throughout his life to delve deeper into his own faith,” says John. In early 1950, Johnny left home and joined the Air Force. He served three years in Germany and was honorably discharged. When he came back to the states, Johnny married his first wife, Vivian and had four daughters. Johnny tried his hand at various careers, but music was in his heart. In the 1960’s, John says it was hard for his dad. “He struggled in many ways with his own internal demons,” says John. Vivan and Johnny were divorced by 1968. “Though he had known and worked with June Carter for years, it wasn’t until then that his love for my mother truly flourished,” he says. John’s grandmother, Maybelle Carter, was the Queen of Country Music and was the creator of a guitar style known as “The Carter Scratch.” She weaved together bass string melody lines, chord strums and high string rhythms to create a sound no one had ever heard before. Her style directly influenced artists such as Chet Atkins, Jerry Garcia, Joan Baez, Bob Dylan and Keith Richards. The Carter Family recorded more than 300 songs in their careers from 1927 to 1941 and spread country music to the world through border radio stations. These stations, just across the Mexican border, were broadcasting a staggering 500,000 watts of signal. In the US, the limit was (and still is) 100,000 watts. When June was 10, she was performing with her family. As a boy, John recalls visiting his grandmother who made homemade pickles. “I remember helping her make them as young as 5 years old,” he says. She worked her whole life as a performing musician but nothing was more important than togetherness of family. “There was no better place to keep that family close than at the supper table,” says John. Maybelle grew up in Virginia where everyone hd their own gardens, fruit orchards and raised their own pigs and cattle for slaughter. Because of their musical talents, the Carter Family travelled around the world and while doing so, expanded their culinary knowledge, adding their own flair to each creation. Johnny and June met backstage at the Ryman Auditorium one night during a performance of the Grand Ole Opry in 1956. In 1967, Johnny turned his life around.He had given up the addictions that ruled his life and reestablished a relationship with God. In 1968, on stage at the Ryman, June and Johnny announced to the world that they were to be wed. They married the next day, March 1, 1968. Two years later, John was born. Both of his parents were at the apex of their careers and John traveled with them around the world. Though they didn’t push their son to be in show business, John found his place in the recording studio. He has recorded Loretta Lynn for the past 11 years and co-produced with her daughter Patsy more than 100 songs. He has produced thousands of songs for various artists and carries on his parents’ musical heritage. Through the years, John continues to cook his family’s favorite recipes. 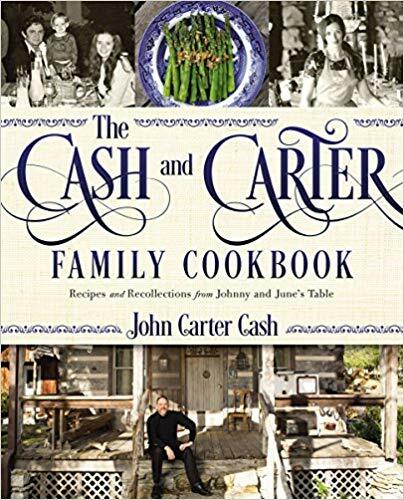 Today his wife and children are also creative cooks whose recipes are also included in The Cash Carter Family Cookbook. All of the dishes, glassware, silverware, plates, etc. were June’s personal china. The cast-iron pots and pans were used daily in his parents’ home for years. “I now use them every day in my own home,” says John. The huge, mahogany dining room table is also in John’s home.